The Brewster F2A-2 Buffalo is 686.7 KB. Larger files take longer to load. This is the Brewster F2A-2 Buffalo listing page, here you can download the plan, article and see the main thumbnail and extra images. The Brewster F2A Buffalo was a US Navy carrier-based fighter aircraft which saw service early in World War II. Designed and built by the Brewster Aeronautical Corporation, it was one of the first U.S. monoplanes with an arrestor hook and other modifications for aircraft carriers. Although superior to the Grumman F3F biplane it replaced, the Buffalo was largely obsolete when the United States entered World War 2 being unstable and overweight, especially when compared to the Japanese Mitsubishi A6M Zero. The model presented here is a 44" span sport scale model designed by Jack Bale for electric propulsion; an Astro Flight 25 is suggested for power. The plans sheet shows detailed wing construction information, including structure and linkages for ailerons and flaps. 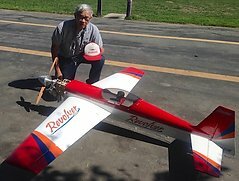 Details of the stubby, barrel-shaped fuselage, specifically the fuselage longitudinal keels, are not shown in as much detail, and this reviewer presumes the fuselage is planked with sheet balsa. These are the details for the "Brewster F2A-2 Buffalo" plan. If you would like to become a plan editor and help us to edit the attributes of all the plans in the website please click the "Edit Attributes" button below. Order your Brewster F2A-2 Buffalo prints today! 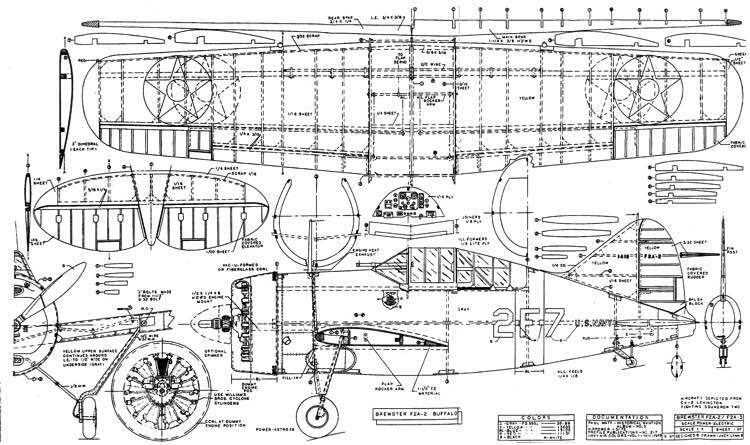 The Brewster F2A-2 Buffalo plan can be printed on plain paper, tracing paper or polyester film and shipped worldwide. This tool allows you to calculate the cost of printing and shipping the Brewster F2A-2 Buffalo plans and its building article if available. If you need to resize a plan please contact us with the ID:79962 and the desired wingspan. I will calculate a price upon request, please contact me here mentioning this PlanID: 79962 and the job you wish me to do. This plan is 686.7 KB and was shared by our member aeroastro on 25/03/2015 16:18 in the PDF Bitmap Wood Model Airplane Plans (2) category.